(Nanowerk News) Call them tattletale pills. 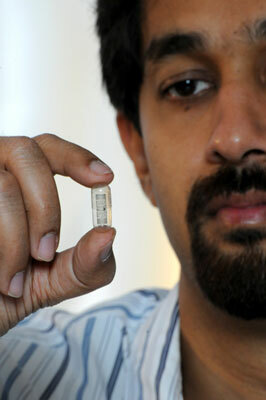 Rizwan Bashirullah, a University of Florida assistant professor of electrical and computer engineering, holds a pill capsule designed to signal when a patient has swallowed it. The researchers presented their findings at a conference in Japan last year and are currently at work on a scholarly paper about their research. They have applied for patents, and Bashirullah said a UF spinoff company is seeking to develop the next generation of the pill for FDA testing and commercial development. The research was funded by grants totaling about $700,000 from the National Science Foundation, Convergent Engineering and the Florida High Tech Corridor Council.